An honest and chivalrous adventurer that pursues just causes, you would sacrifice much to help others. I am a Ranger. We walk in the dark places no others will enter. We stand on the bridge and no-one may pass. We live for the One, we die for the One. 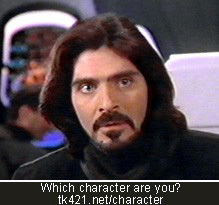 Marcus is a character in the Babylon 5 universe. You can read his profile at the Worlds of JMS.